Hello friends! I am really excited to post another addition to my “My New Favorite Things” series. Actually, I don’t know if this is a series, so for now I am pretending it is. If you missed my first post, you can read it here, and all “My New Favorite Things” posts will be linked here. The reason I write these posts is that I really seriously get excited when I find a new favorite thing. I love feeling like I have found the perfect solution. This might be something huge like “I will change my life to only buy this brand forever and ever” or a smaller pick-me-up like “whenever I see this new thing I can’t help smiling!”. And I have to tell someone – so today it’s you! Today’s edition is inspired by my morning routine. I have the same routine every morning (which I am sure everyone does) and I love new little things that brighten my morning. Hopefully these things will make you smile. Because I make my lunches in the morning, I thought I would tell you about this awesome lunchbox from Amazon. I have an unnatural love of Lock and Lock Food Storage Containers. I have gotten to the point that they are the only food containers I allow to stay in my kitchen. Sorry, I can be a brand snob. (Just for the record, I am not paid to say any of this! And, I definitely don’t get money if you go buy these things. This is just me running my mouth!) But, when I was looking to buy a new lunch container, I figured I would stick with a brand I love. And I was not disappointed! The quality on this thing is stunning. The outside has excellent stitching and an adorable little tag, and the inside is beautiful real insulation. It comes with three Lock and Lock blue sandwich containers. They stack perfectly in the bag (fit to perfection) and I just must say again – the quality is outstanding. I had a few gift cards, but I don’t think $25 is too outrageous for a 7 piece set. I just wanted you to know about this new love of mine! And, to go with my lunch – here is my new lunch snack. 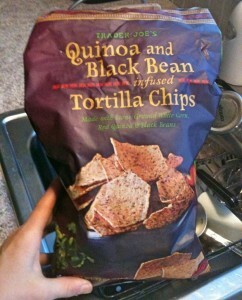 These Trader Joe’s Quinoa and Black Bean (Infused) Tortilla Chips are SO GOOD. Just saying. I always take a slough of vitamins in the morning, and lately I have been testing the merits of Biotin. I have read so much about this vitamin, and its super amazing affects on hair, skin, and nails. I have been taking this a month and feel like it’s working, but who knows! I found this cute bottle at Kroger for buy one, get one free. These are 3000 mcg/each and 120 vitamins/bottle. And, its cute :). Lastly, I must tell you about my new favorite app – YouVersion. I have used YouVersion for awhile now for Bible readings, Devotions, and Bible memorization. But, the other day my friend Kristy told that it will read the Bible to you! To quote her: “…this wonderful man reads to me while I drive!” This morning I tested it, and it is marvelous. Just pick your passage and translation and select “audio”. It doesn’t hurt that the reader has a beautiful, thick, masculine voice. The KJV Listener’s Bible is my favorite version, and it is read by the Fellowship for the Preforming Arts. And now, I can soak up the Word of God while I am driving. I just love it.